Puzzling Mix | Education requires a puzzling mix of technology, media, design and community. A couple years ago I got into drones, quadcopters, in a tentative way. I kept crashing or losing my Parrot Bebop II drone. They were tough little guys of the “takes a lickin’ and keeps on tickin’ variety.” But I got better at it. I currently fly DJI prosumer drones including the Spark, Mavic Pro and Phantom 4 Pro. I mostly fly them for the pictures and videos they capture. Though I’m not licensed by the FAA I do follow their requirements before flying. I also research local laws before flying. I use several apps including the FAA’s B4UFly and AirMap. Both help identify where to fly legally and safely. In Texas, where I am as of this writing, the drone law requires that before I fly over private land I must obtain the permission of its owner or someone occupying it. I can fly, at a low altitude, over publicly held land. I can’t fly over certain state parks. So it was yesterday that I set up to fly my Mavic Pro drone under a canopy of leafless trees at the intersection of Kickapoo and Cougar Roads a little south of Interstate 20. I was trying to find a place where I could fly over the Brazos River to take some photos and shoot a video or two. It’s all private land between me and the river. There’s a ton of No Tresspassing Posted signs with homes set far back from the road. So I didn’t get a chance to do much asking (to fly over) private land. So my flying was mostly limited to brief excursions like this one over public spaces. As I was setting up a woman driving by stopped to ask what I was doing. I said I was flying my drone (it was then about 20 feet from me at a height of five feet). It was easily visible to hear; I had the drone’s camera pointed away from her, as I hadn’t had a chance, yet, to ask her permission. She self-identified as the owner of the land I was next to. When I asked if I could fly over it, she replied “No.” Then she drove off and a moment or two later I landed the drone, packed it up and moved off down the road myself. Over the next hour or so I left a phone message or sent an email to the owner or manager of ranches I passed. Some of them have signs at their entrances. I’d google them and some had websites where there was a phone number or email address listed. I figure that maybe next time I pass through the area I can fly over the land of them that provide their permission. On the outskirts of Glen Rose, Texas I passed some metal statues of two horses being chased by a cowboy on a third. When I pass cool stuff on a highway Like that the thought, “I may never pass this way again. Is it worth it to..” This time it was. I turned back and sought to find a way to contact someone occupying or owning the land. In this particular case there wasn’t a “No Tresspassing Posted” sign at the entrance to the land. I parked at the edge of a gravel road and walked the 100 yards or so to the residence. A moment after knocking on the door a young man answered. I asked and he said “Yes.” I found out a little later that his name is Trevor Crawford and that I was at the C4 Ranch. I thanked him, walked back to my car and drove back to the horse art. I spent the next 20 minutes flying over the metal artwork and taking some stills and shooting brief clips with my Mavic Pro. As I was packing to leave Trevor drove by in this big truck (that I wish I had because my Honda CrV is low to the ground and there’s many places I can’t go) with high clearance. He asked if I’d be so kind as to send him links to the photos and videos I was taken. I asked for and received permission to take his photograph. I said I’d gladly send links. He then told me about some “little cattle” on land of his nearby. Next time.. I think it’s natural to get discouraged when someone tells you “No.” The thing is that to get what one wants from someone else asking is something you have to do. Keep asking. Be assured a yes is out there with your name on it. I took the long [long] way home after visiting my brother in California. I went down a road away from home to take me home. Driving down a highway towards Yuma, Arizona I passed a canal. I was doing 65 mph. Off to my right, going over a bridge, I saw a lone palm tree. In that moment I composed a photograph in my mind’s eye. The only problem was I was going 65 mph and my actual eyes had moved on. I guess you might say I had to turn around, do a 180, to go get my imagination back. I’m in the process of revisiting an elearning authoring tool I used some time ago: Storyline, now in its (I believe) third iteration. This version being named Storyline360. My plan is to return to my roots and design online learning again. I’m thinking of snippets of learning to aid teachers in reimagining their PD (professional development) experience. What this might look like I can’t say at this point. I need some design thinking help from my PLN (professional learning network) to identify the first snippet. Another 180 and I’m on my way. CDB: Christina Davies Beeson would be proud. A moment ago I used something she taught me in 1972. She taught journalism and sophomore college English at Colton High School in Colton, California. 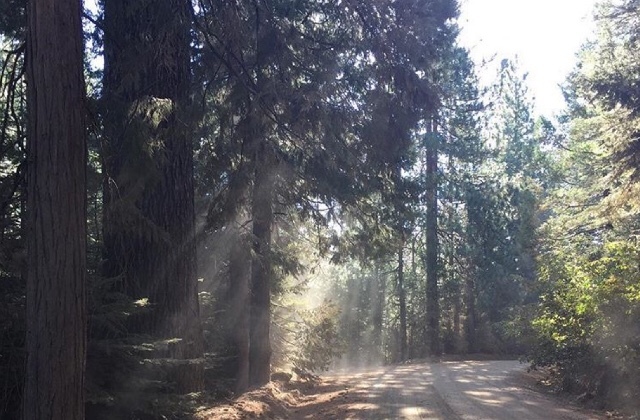 A blog post I finished reading a moment ago, by Aaron Hogan, brought it all back to me. The double entendre. Aaron describes, in his blog post, risk. But that's not what resonated with me as I read his thoughts. Uncalculated leapt off the page as I read. Whom did the uncalculation? Shaker-man was just into the music, the experience of listening and doing, of feeling something down deep and wanting to be a part of it. That's being in touch with one's soul. Did he plan on being called up to the stage? I think he simply likes the shake. The singer on stage, his was calculated. He wanted to get what he perceived as a disruption away from those around him. It was luck that the rest happened, that the experience played out as well as it did. My take is uncalculation is its own reward. Being who we are, naturally, makes an impression. I can't help but wonder: In those moments before being noticed by the singer, was shaker-man really disrupting the listening experience of nearby fans? Maybe he was adding to their experience? Design thinking involves iterative fails. Just how many depends on one’s persistence or, from another’s perspective, foolhardiness. When I was a wee lad I had my share of owies and oopsies. Some were worse than others: cuts, scrapes, burns and a broken/smashed bone or two. For the most part these healed and were then forgotten. I learned from them: how to walk, run and ride a bike. The cost of learning back then was relatively cheap. Later on, mistakes got more expensive. The artifacts, evidence seen by others of one’s fails, became more abstract and less entertaining to talk about. That time I broke my ring finger is an interesting story now. Getting that F- in a math test isn’t something I generally share with people I meet on the street. When as an adult our performance on the job is rated against that of others there are often scars to our psyche that are invisible to our peers. Looking back on my learning the past 60 years I find that the stuff I remember [and apply] most often was enjoyable. On some level curiosity made me want to learn it. Engagement made me continue doing it, though it may have involved sweaty stinky work and lots of it, til I got it right. It isn’t access to peers or information that encourages [my] learning. It’s the relative cost of making a mistake. The really cool stuff that has had a lifelong impact on me involved owies that are fun stories to share now. When I approach learning now I try to morph it into something that involves my whole body. I think that’s the ticket to design thinking and innovation. The more we approach it holistically and with others so that what we do is visible the better off we are in the long run. Go out and break something. Another sleepless after an EdCamp night. This time it was EdCampNavasota in Navasota, Texas. It could have been just about any other one though. It began innocently enough, almost by accident. I happened upon a hashtag nine days ago: #PEDAGOME. They seemed to be discussing ways for students to share their learning using a portfolio creating app called Seesaw. Seesaw, I learned, makes it easy to create and share student portfolios. A student can take a graphic, a #booksnap of a page in a text, and annotate it with words or pictures or narration. The idea is to share perspectives among a community of students. CAN YOUR LMS DO THAT? At EdCampNavasota student portfolios came up. The sharing was fast and furious. The parts I was able to capture included Seesaw, making ideas visible and.. That was as far as I got. A lightbulb went off in my head. How might we use portfolios in elearning? Enjoyably. I've seen sharing in elearning before. Usually it integrates with a business unit's blog. Someone learns something. Then they post a blurb about it in the blog under their byline. Sometimes there's a link to an external resource. Sure, it's functional. But it's flat, too. Stuff like that doesn't excite so much. What if it were possible to take a screen capture of a bit of elearning content and mark it up (annotate it) using drawing tools? 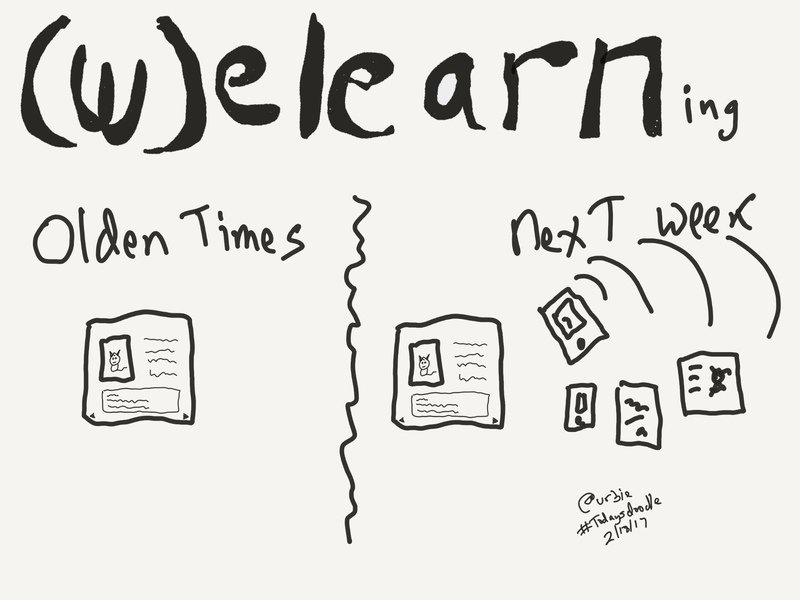 What if this snippet of learning made visible were shared, maybe in real-time, with others? But instead of going out on that blog the image, a #booksnap I've learned they're called, is embedded, sticky-note like, on the screen it came from? Or maybe it does go out to an external resource like Padlet? I wonder how I could prototype this to share with my next client? Would they be interested? Maybe.. I came this close to making it to #EdCampSD in San Diego. Something came up and I missed making it three in a row. No biggie. I have some time now to reflect on my recent #ReimaginePD experiences over the past few weeks. It's rare that I experience collaborative professional development close to home. It's almost hundreds of miles away that I travel to meet with other educators to, basically, “see what happens.” Often time the takeaways can be expressed in a few words. In St. Louis last month what I learned resolved down to being mindful. Whatever it is I find myself doing I can trust I can do it being mindful the heart of an entrepreneurial person continues to beat in my chest. Thing is, being an adult about it, learning sticks when it's memorable. Which means like a boomerang it keeps coming back. Which is why I often stop by cool things I pass, sometimes to peruse, other times to photograph. I don't know what I know until I make time take time to see where it fits. 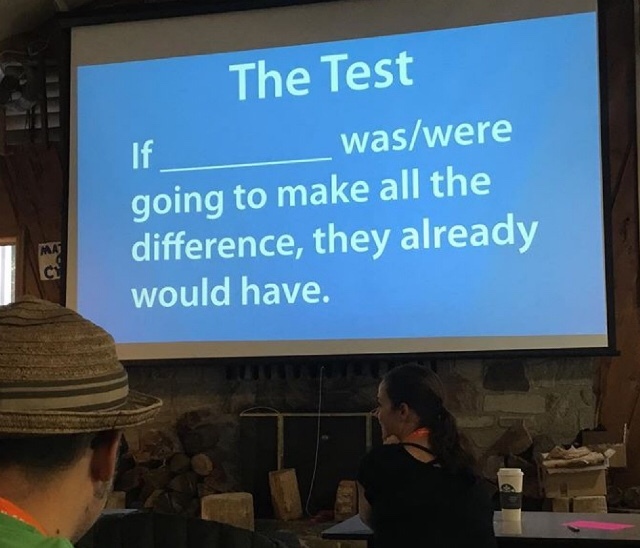 At EdCampYosemite educator Jon Corippo shared this slide. There were, maybe, thirty people in the room, educators all, and me, a learning experience designer. That means there were that many interpretations. What I took from Jon's sharing is doing differently. But not with stuff. And definitely not with tools. The constant in my work life and probably teachers', too is people. I have people to train up. Teachers have kids to educate. Methinks we have tools aplenty. What I need is to dare more. Sensing danger ahead because I haven't been this way before do I turn back or forge ahead? In this instance, once the butterflies had grown to the size of dragons, I turned around and found my way by revisiting the path I had previously taken. Some PD (Professional Development) fills me with dread. What I think is fear of being called on to do something among strangers is scary. But maybe the scary feeling can be adopted, adapted or coopted, to teaching and learning. Then again, maybe the dread comes from the fear that this PD is going to be more sit and get? I understand that somewhere near San Diego today an EdCamp is underway where teachers made stuff with cardboard. How might we use ubiquitous stuff like cardboard and tape to make PD surviveable? I use survivable here in the sense the experienced rescued me from the job's doldrums and dropped me off in a place where I can excitedly share my tale. I had her for 10 days, my DJI Phantom drone. I bought it at a BestBuy on my way to Yosemite. She was a dream in the sky. This was the best I could do drawing the Phantom from memory. I returned it Friday. In a couple of weeks I'm getting the Next Big Thing: a Mavic Pro drone. It's smaller and goes further. Best, it's got the same great camera and is more portable. Like many my family sometimes went on road trips. Papa liked to leave before dawn, when it was still dark. He called it “first light.” It was exciting making final preparations for the adventure to come, going off into the unknown. Flying my drone, I still have my Parrot Bebop2, is like that. Going on a trip, not knowing for sure what lay ahead. I love PD like that. How do I self-motivate when the going gets rough, tough, boring or other? Someone asked me that the other day. Here’s my take. AND THE DIRTY LITTLE SECRET IS.. Reflection. I hold myself up to my existential bathroom mirror and take a long look. What does it feel like my eyes do when seeing something new? I’m in my “Oh no!” zone. I don’t feel safe enough to start learning right away. I’m in the “Let’s do it!” zone. What are we doing just standing around? Let’s have at it! I’m in the dreaded “What the..?” zone. I’m having a problem fitting what I have to do with what I know has worked or not worked in the past (sometimes going back decades). The hard part, once I’ve reflected and figured out which zone I’m in, is not zoning out. That is, how do I overcome the Fear, Uncertainty and Doubt (FUD) Factor and apply some grit and adopt a growth mindset approach and get on with learning? It’s easy to fall into the woe is me trap. Speaking from experience, it can be a lot harder to level oneself and just do it. What I do is remind myself that I’m [most likely] not alone. (It’s a little like the OODA Loop I learned and practiced in the US Navy a long time ago.) I have support and help available. All I have to do is ask for it. Sometimes it may not feel like it. Depending on how peers and managers respond can kick one back a few steps. I’ve occasionally asked myself if it’s really worth it to keep trying? A while ago, I think it was towards the end of 2013, I stumbled upon a different way to do Professional Development (PD). What I tripped over in my dark was EdCampWestTexas, now in its third year. Basically it was K-12 teachers coming together on a wet and rainy Saturday morning in Abilene, Texas. In a few short hours I was exposed to new ways of knowing. While most of what I left with was skewed towards educational technology, the main takeaway, the jewel, was Design Thinking (DT). DT is a problem solving methodology grounded in empathy, reframing problems, and prototyping. It makes me a little sad, when I reflect on my past years practicing the art and science of instructional design, how technical I was. I should have empathized with the people I supported more. During my first-pass at design thinking, at a law enforcement training academy, I began the analysis phase of instructional design with a soft-question: What did it feel like doing/learning this thing? It made for a more human/humane approach I think. It had some serious benefits, too. The rest of the process took less time. The team was more involved than ever before. A complaint I often hear from other instructional designers is how hard it can be for people to keep meeting and deliverable commitments. Once I adopted a design thinking approach that reluctance to contribute gave way to some serious collaboration. If the empathy, caring, is there then so am I. If it’s not, it’s time to ask “Am I in the right place?” Maybe it’s time to move on? I’ve been trying to learn something new for a few months now. I don’t want to get too deep into the details here. I’ve been in the “What the..?” zone for a while. I think I’m starting to see light at the end of the tunnel though. I’ve sought some serious help from some smart, dedicated and caring people. The hardest part has been learning by making mistakes. I still make some significant ones. Not giving up, continuing to pick myself up and owning the mistake, communicating clearly to clients and peers has made all the difference. How do I motivate myself to learn new stuff? Design thinking.